1101/R8 - Crystal frame and grey polarised lenses with back surface anti-reflection coating. 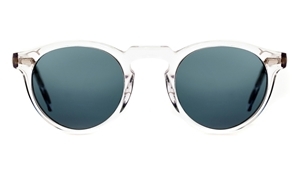 The Oliver Peoples Gregory Peck OV5217 is a 1940's inspired unisex acetate sunglass that features a keyhole bride, that gives the sunglass that 'retro' look, and also makes it ideal also for people with non-european features. The Oliver Peoples Gregory Peck OV5217 sunglass comes with its own branded case, cloth and packaging, and also covered by the sendoptics 12 month no quibble guarantee. 1031/P2 - Matte black frame and grey polarized lenses with back surface anti-reflection coating. OV5217-S 1485/W4 - This updated version of the iconic Gregory Peck by Oliver peoples adds a modern touch with Gold Mirror mineral glass lenses. 1001/53- Cocobolo frame with cosmik brown lenses and a back surface anti-reflection coating.